As part of our day-to-day operations, we are focused on delivering sustainable outcomes for the environment. 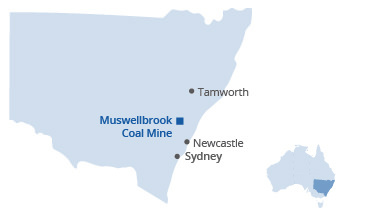 Muswellbrook Coal Company (MCC) works closely with the Muswellbrook Shire Council and other regulatory bodies, as well as independent environmental consultants and other coal mines in the region to minimise the impact of mining activities on the local environment. The mine operates in accordance with a series of Management Plans approved by Muswellbrook Shire Council. This includes an overarching Environmental Management Strategy which includes management plans for flora and fauna, land management, water, cultural heritage, visual amenity, blasting, noise, air quality and spontaneous combustion. These management plans are aligned to addressing mining conditions outlined within the MCC Development Consent. Through regular environmental monitoring, Muswellbrook Coal monitors the success of our environmental initiatives to deliver quality outcomes. We’re proud of our rehabilitation program, which seeks to restore previously mined out areas to a combination of pasture and native vegetation including a habitat corridor linking Bells Mountain and Skelletar Ridge. MCC has rehabilitated more than 360 hectares of land, including both pasture and native vegetation. To supplement topsoil nutrients, MCC uses ameliorants such as organic growth medium (OGM) – a compost-like waste product on the rehabilitation areas. These ameliorants are spread over the rehabilitation to promote growth of vegetation required to be achieved under the Development Consent.